Mise en place  is a French term that means “setting in place”. In professional kitchens, mise en place is essential to fast and efficient food preparation. In a home kitchen, you might not need to bother with this that much, but for bento making it’s quite useful. Another thing I do is to stay away from any equipment that is a bother to clean - things like graters (except for a Microplane - see essential equipment page ), whisks and so on. I mostly use a pair of long chopsticks called saibashi for mixing tasks. You don’t have to do a lot of elaborate pre-planning, but just knowing what you intend to make will stop you from wasting time. I pre-plan in two stages; first when I am doing the grocery shopping, and second on the night before, when I put together a short list of what I intend to put in the bento boxes, written out on a Post-It note and stuck to the edge of the range hood. This is rather similar to the order slips that come into a restaurant. [Edit: Now I use this handy weekly bento planner sheet  which makes things a lot easier!] List in hand, you can start cooking right away. I don’t have a dishwasher (I also need a new kitchen!) and I hate to come home to a sinkful of dirty pots and bowls. 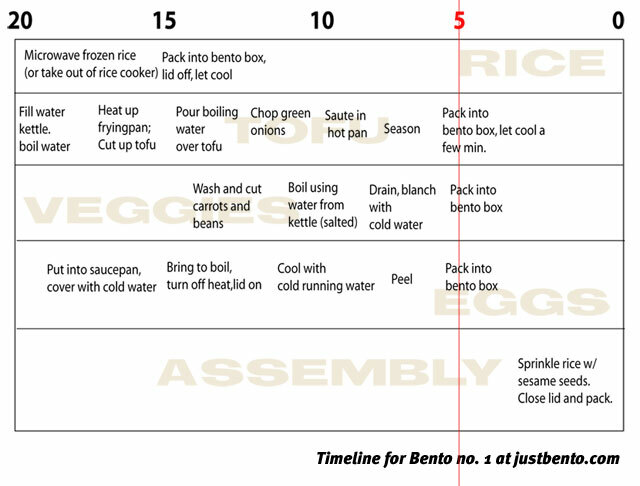 So, I wash everything up before I’m done with the bentos - usually in the last 5 minutes while the bentos are cooling down (see a bento making timeline ). It’s not as much of a pain as it might sound, because I mostly use non-stick pans or coated enamel pans, I don’t use that many pans, and I only use a little oil in anything I make. (Oily mess is the most bothersome to wash up.) I use only a smidgen of dishwashing liquid, and just rinse most things with the hottest water that will come out of the tap.